I’m happy to be linking up with everyone again today for Five on Friday! I woke up early to write this, but our little man is woke up early too, so I need to get going on my 5! Thanks as always to April, Darci, Christina, and Natasha for hosting! ONE: End It Movement. I’m sure you all saw red Xs on peoples’ hands yesterday on social media. I regret that I didn’t participate, but I thought I could at least share it here. My cousin wrote a great post about it. I also wanted to include a link to the main website. This site has a video, and lots of very eye-opening facts about modern-day slavery. I read Tomatoland last summer (because I am a food nerd) and my eyes were truly opened about how slavery still exists in conventional farming. In America. If you read it, you will only ever want to eat organic tomatoes. It is a tragic situation that we need to be aware of. Proud of my friends, my church, and our generation in general for speaking out. Also, End It Movement has some great organizations that they partner with, including the A21 campaign. All of that info is on their website. TWO: As I mentioned before, I’m trying to wake up early. I’ve woken up around 5:15-5:30 the past few days. My goal is to wake up and get a few things done before Davis is awake. 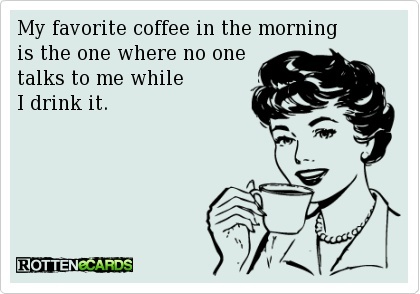 Oh, and drink my coffee alone. Right moms?! It just helps me have a better attitude and a clearer mind before the day actually starts. The other day I was able to wake up, eat breakfast and have coffee, pack D’s bag, get changed, etc so that we could be at the gym for spin class by 8. Such a positive start to the day! 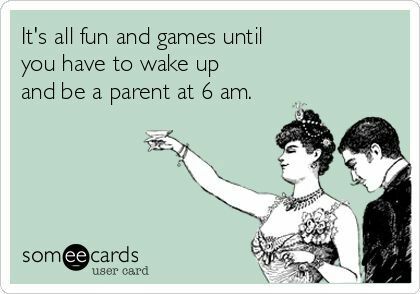 I follow Shay’s Mix and Match Mama blog, and she had some good tips on waking up early this week. She wakes up at 4:30 every day. I don’t think I’ll go that far, but seeing all she accomplishes is certainly motivation. THREE: Our little man wearing my sunglasses. Goodness gracious, what.a.stud.! This reminded me that I should buy him a pair for this summer. Not that he’ll actually keep them on, but still. I like these from Gap or these from Old Navy. 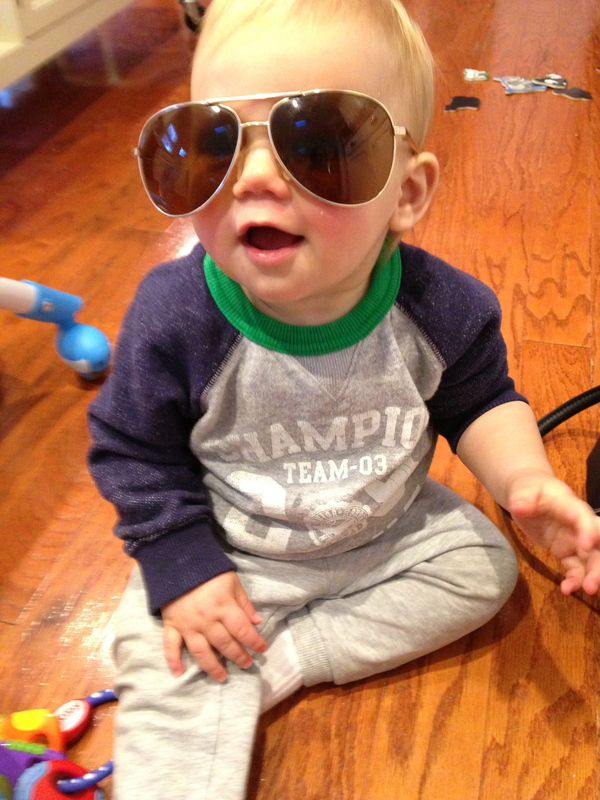 If any other moms have suggestions for sunglasses, etc for toddler boys, please pass them on! 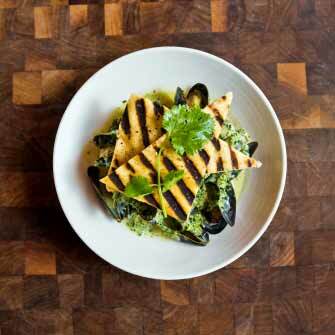 FOUR: Good Food on Montford. If you live in Charlotte, definitely try this place! Todd and I went on Friday night and really enjoyed the food. It’s all small plates, and has influences from all over – we had everything from Southern fried quail to mussels in a curry coconut cilantro broth (pictured below). Highly recommend. FIVE: H&M find. 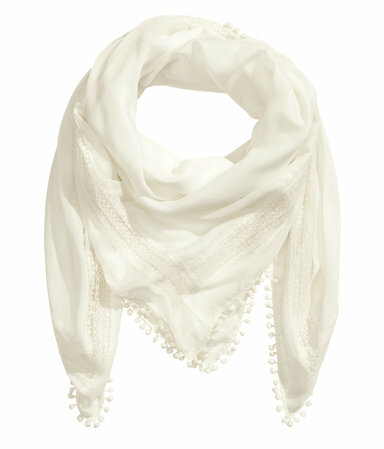 I had to go yesterday to return some things and found this pretty pom pom scarf. It will be perfect as a transition piece into warmer weather. It looks more white and less beige in person. Also, it was only $12.95. One night last week we had just vegetables for dinner. Girls, you know your hubbies just love those meatless nights, right?! (sarcasm font) No, actually Todd was a great sport about it. 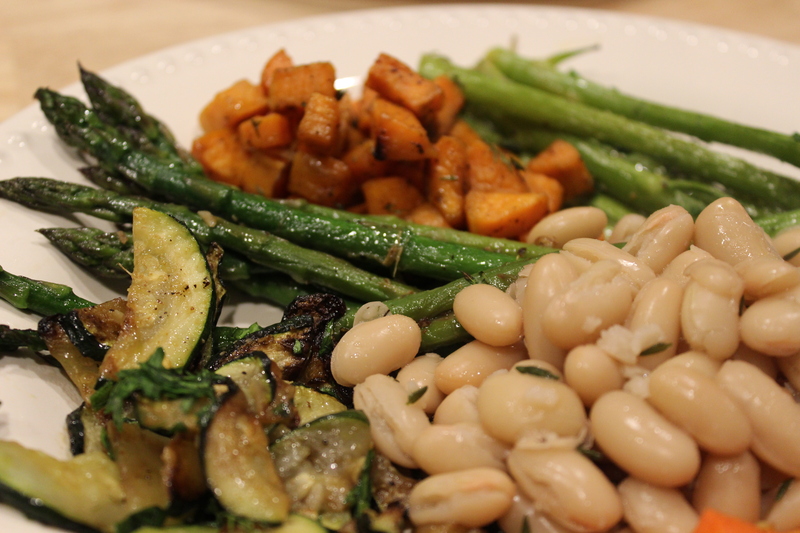 I had a lot of vegetables and fresh herbs that needed cooking, and some methods I wanted to try. Plus I felt the need to detox a little. So veggie dinner it was! Peel whole carrots, cut them in half, then into long narrow pieces. Toss in a little olive oil and place on a baking pan covered in parchment. Roast for 25 minutes at 375, then remove and toss with a squeeze of lemon juice, salt and pepper, and some fresh dill. Roast a few more minutes if needed. 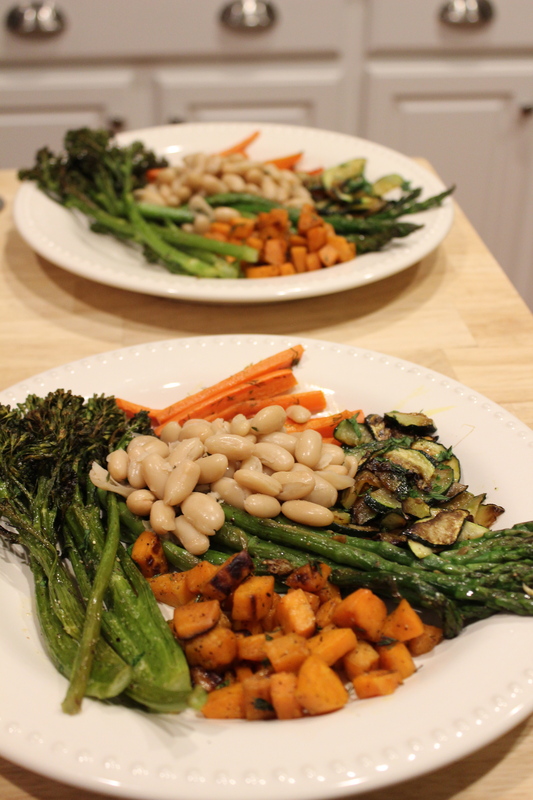 (I roasted these on the same pan as the broccolini). Wash broccolini and cut the bottom end off. (I did not cut the end off, but I should have). Toss in a little olive oil, salt, pepper, and either fresh minced garlic or garlic powder. Roast on the same pan as the carrots for 20-25 minutes. Before serving squeeze fresh lemon juice over the broccolini and season again with salt and pepper if needed. 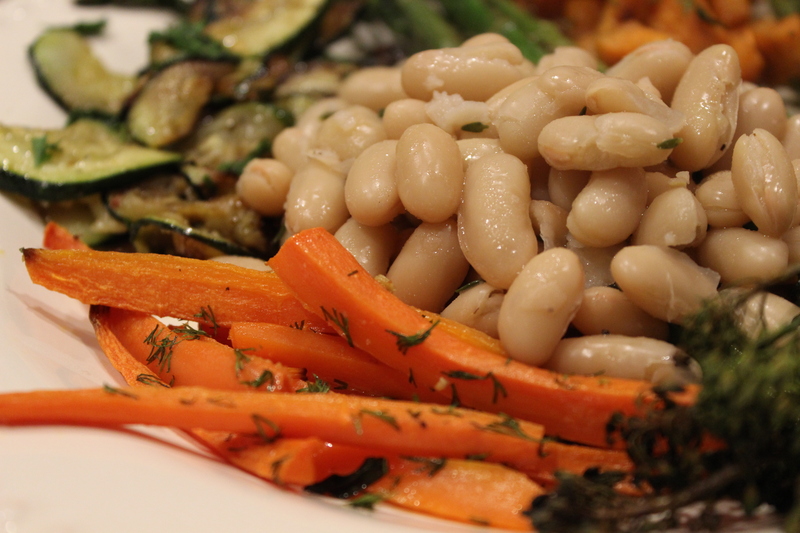 Normally I like to braise white beans (starting with dried Great Northern beans). This time I simply drained and rinsed a can of white beans, slowly simmered them in water with a couple sprigs of fresh thyme and a bay leaf for about 30 minutes. When ready to eat, season with salt and pepper. You could add a pat of butter to make them a little creamier. You could easily roast these, but I decided I wanted them a little crispier. I sautéed them (5 medium sweet potatoes, peeled and cut in a small dice) in a large nonstick sauté pan. Heat to medium or medium high, add 1-2 Tbsp olive oil. Add the potatoes to the oil and toss. Let sauté until the potatoes start to brown and have crispy edges. Turn the heat down if they are getting too brown – you’ll want them to soften as they cook. Once cooked through, season with salt and pepper and fresh thyme. These are great reheated or served right from the pan. Cut the zucchini in half length wise. Then cut into slightly diagonal half-moon pieces. Add to a heated sauté pan with 2 tsp olive oil. Season with a little crushed red pepper. Cook until zucchini is browned slightly and starting to soften. At the end season with salt, pepper and fresh parsley. My mom makes sautéed asparagus with ginger, and it is such a great flavor combination! We typically use ginger powder, but I had fresh on hand, so I tried it that way. Wash and cut or break the bottom ends off of the asparagus. Heat a large sauté pan, add 2 tsp olive oil. Add the asparagus, toss, and cook for about 6 minutes. Add the fresh ginger and cook for a couple minutes. At this point the asparagus should be cooked through. If it is cooked through, season with salt and pepper and cook for another minute. You could absolutely serve any of these with a meat or main dish. I hope some of these are helpful with your vegetable cooking! I always appreciate posts where moms have gathered together a list of some of their favorite or most-used items for their baby or child. It is so helpful! Whether you are registering or figuring out what you need for your child’s next stage in life, other parents are the best knowledge source. I’m not an expert by any means, but I’m hoping that by posting some of our favorite things in this stage, it can help another new mom. Or maybe it could help you find a birthday gift for a friend/niece/nephew! 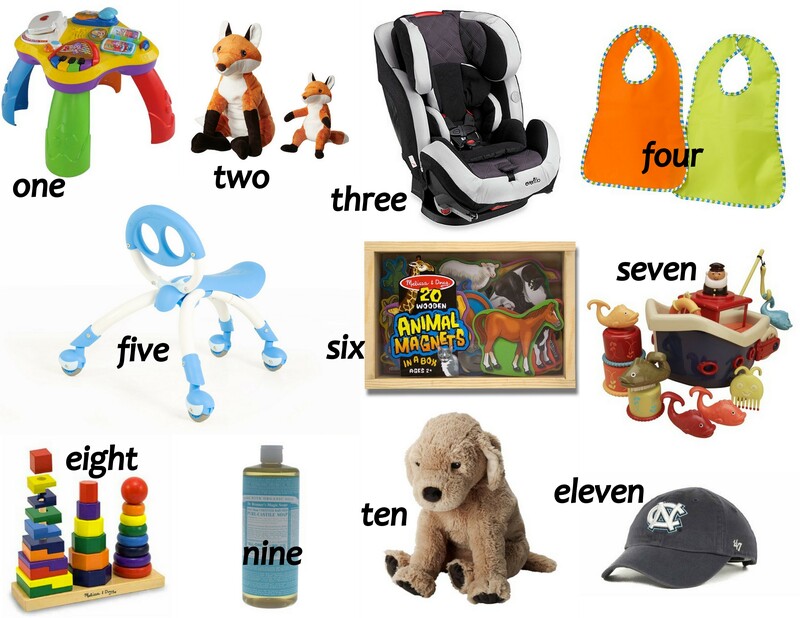 Davis is 14 (almost 15) months old, but many of these items have been favorites for a few months now. Some are more geared toward boys, but most of the ideas would still be great for little girls! Turning one is certainly a transition time for babies! It was key to have new toys, a new car seat, and new ways for Davis to learn around that time. 1 Fisher Price Activity Table He plays with this every single day. 2 Ikea Fox Stuffed Animal My parents gave him this for Halloween. Because, he dressed as a fox, and doesn’t everyone give gifts on Halloween? ;) Regardless, he loves these stuffed animals! 3 Evenflo Symphony DLX All-In-One Car Seat We switched to this car seat when he was around 10 months old. He is still rear-facing, but this seat can transition to forward facing and then to a booster. It is so easy to get in and out of the car, too. 4 Ikea Bibs Todd’s mom got us these bibs, and my cousin uses them for her son, too. They’re very inexpensive, durable, and easy to clean. 5 Y Bike This was also a gift from Todd’s parents, and it is Davis’ current obsession. 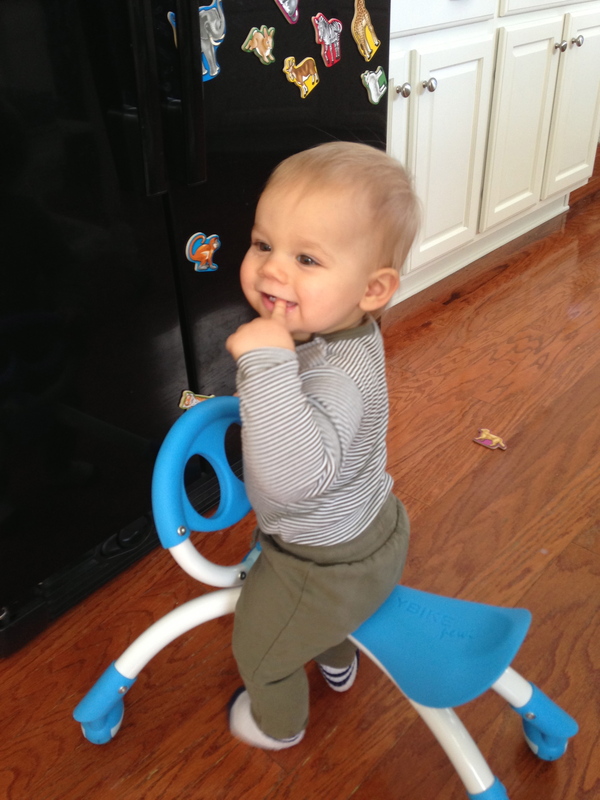 He loves to ride on it and use it as a walker. It works well on hardwoods and carpet. It also travels well because it is very light. 7 B. Fish & Splish Boat This was a gift from our friends Justin and Katie. There are so many components in this toy and it makes bath time so fun for Davis! 8 Melissa & Doug Geometric Stacker By far one of Davis’ favorites. Another thing he plays with every day. I found it on Zulily, but you could also buy it on Amazon, and it can probably be found at Marshall’s or TJ Maxx. 9 Dr. Bronner’s Pure Castile Soap My friend Margaret gave us this soap in a gift basket before Davis was even born. We’ve used only that soap for his baths and we just finished the first bottle! He has never broken out or had any skin irritation. It is pure and natural, and I would highly recommend!! 10 Ikea Golden Retriever Stuffed Animal We have a golden retriever, so this is perfect for Davis. It’s very soft, and he sometimes even sleeps with it in his crib. Plus it’s cheap! I’ve washed it in the washing machine and it held up great! 11 UNC hat We get asked about this a lot. We found this hat at Lids, and it was such a great investment for Davis. It isn’t a “cheesy” looking baby hat, but it stays on his head really well, and he never seems bothered by wearing it. Plus, Go Heels! 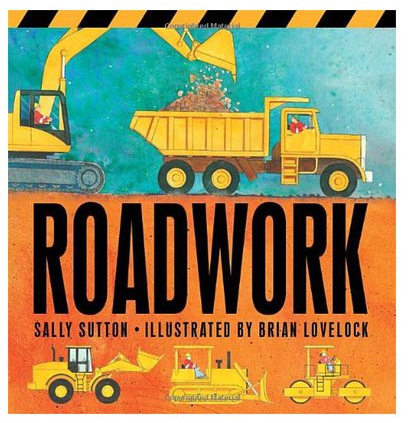 One thing I forgot to put in the collage is the book “Roadwork” by Sally Sutton. Our friends Lani and Brian gave this to Davis for his birthday and he loves it! He says “k-uh k-uh” for the trucks. He loves any board book, but this is definitely one of his favorites. Thank you for reading! If anyone has any other ideas for this age, I’d love for you to post them in the comments. I am making some gluten free cupcakes for a baby shower this week, and figured this past weekend was the perfect time to experiment with this recipe. 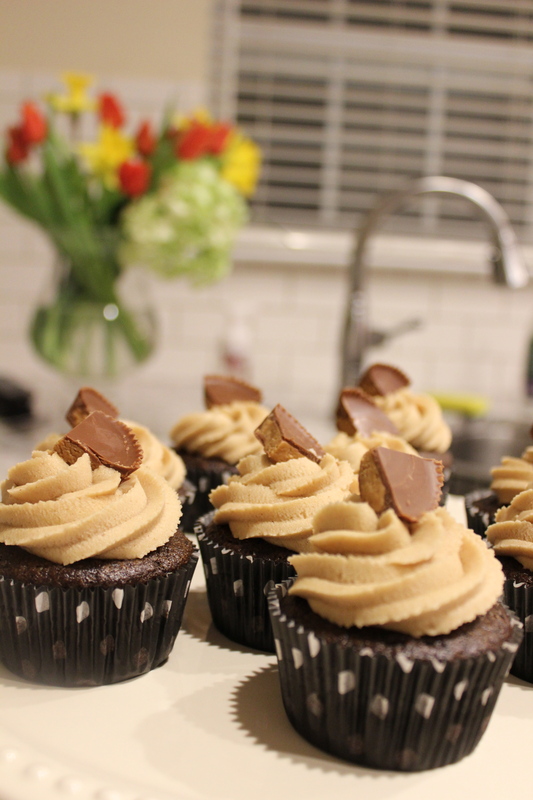 For the baby shower I’m doing vanilla cream cheese buttercream, but since these cupcakes were for us and friends, I made peanut butter buttercream. 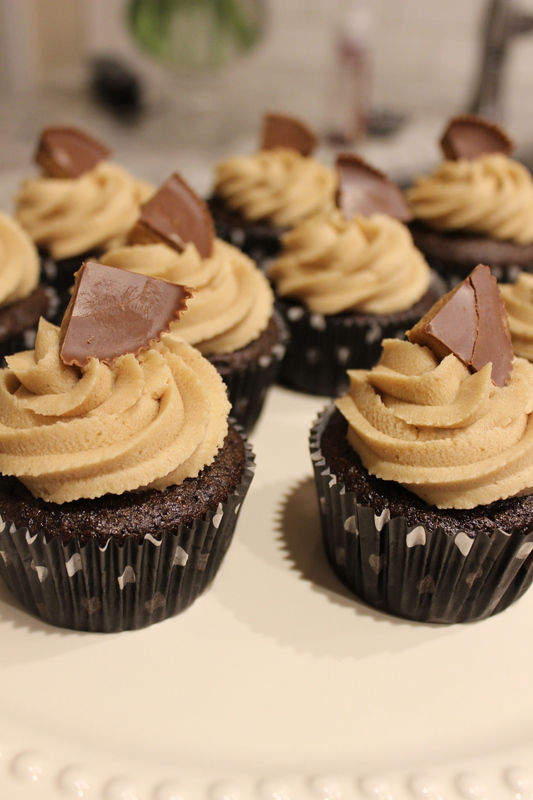 I try not to eat a ton of sweets, but chocolate and peanut butter is a classic combination that I love! These are a good balance of salty and sweet, and the Reese’s cup garnish is simple but definitely adds to the look (plus it’s an extra treat!). I kept this completely gluten free. I would check your peanut butter just to be safe. I found out that Reese’s, besides the holiday shaped Reese’s, are gluten free. The buttercream can be made several days ahead and kept in the refrigerator. The cupcakes are actually better the second day, and they are so so quick and easy to mix together! Preheat oven to 350. Line muffin tins with 20 cupcake liners. Whisk all dry ingredients together in a large bowl. In a separate bowl, mix the liquid ingredients together with a whisk. Add the liquid ingredients to the bowl with the dry ingredients and mix well. Fill the cupcake liners with the batter a little over halfway full. Bake for 15-20 minutes. Let cool for 5 minutes in the pan, then cool the rest of the way on a cooling rack. 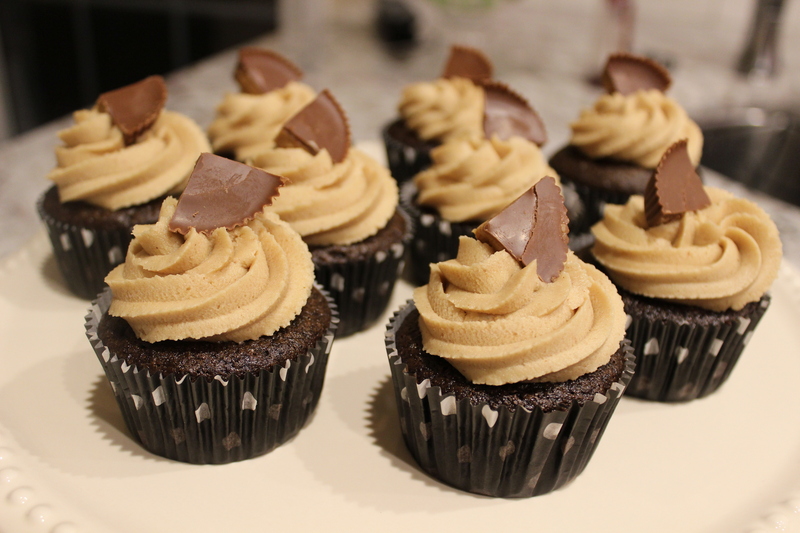 Top with Peanut Butter Buttercream (recipe below) and Reese’s peanut butter cups (cut into quarters). Cream butter in a medium bowl with an electric/stand mixer. Add the peanut butter and mix until mixed well with the butter. Add in the vanilla and salt and mix until incorporated. Gradually add the powdered sugar and beat until fluffy. Mix in the heavy cream and beat until the mixture is light and smooth (about 30 seconds). Let’s be fancy and call them their real name haricot verts, shall we? After all, the skinny string beans variety is much better sautéed than normal green beans. If you make this recipe, either type will work, but go with fresh. Canned or frozen will not work as well. This is a simply prepared side dish that tastes, well, fancy. 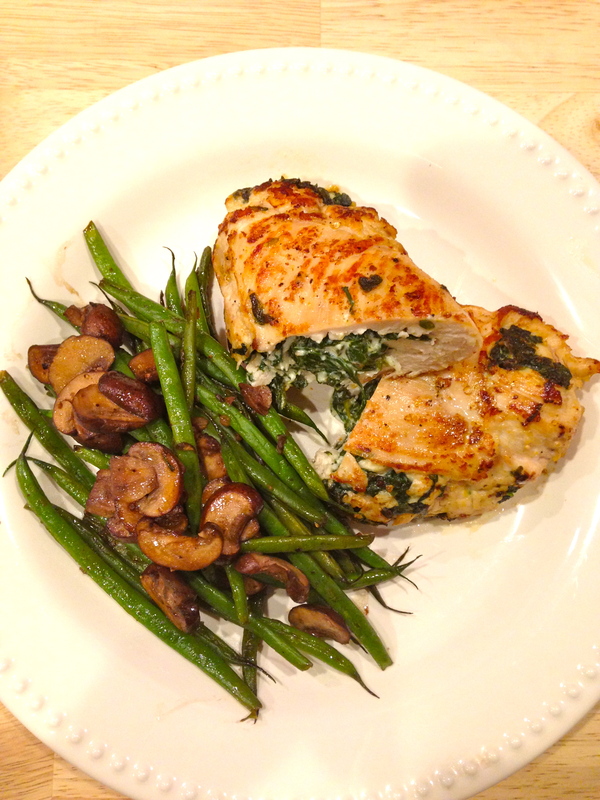 I served it with Chicken Stuffed with Spinach and Goat Cheese from yesterday’s post. It was a great pairing, but these would go well with almost any protein. I think it would also work to make it, chill it, and serve as a salad. I haven’t experimented with that – just an idea. Heat a saute pan. Add the olive oil, then the garlic and let cook for about 30 seconds. Add the green beans and sauté until they have almost all turned bright green. (They go from a dull color to bright). Add the sliced mushrooms and try to put them towards the bottom, near the heat. Stir occasionally. 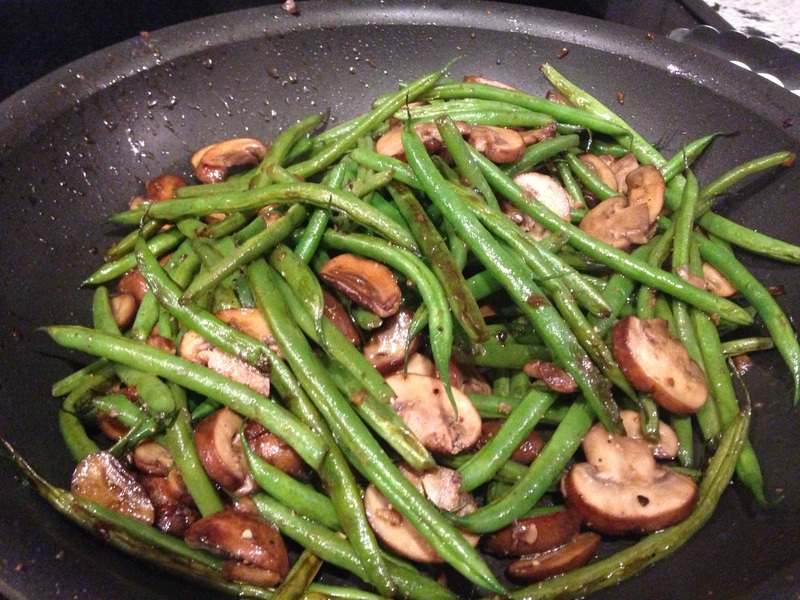 Let the mushrooms cook until the water comes out of them, then gets soaked back up by the green beans. Add the butter, and season with salt and pepper. Right before serving add the balsamic vinegar and toss. I’m branching out from the Mexican and breakfast dishes. First Thai soup, and now this take on Italian…I’m giving myself a pat on the back for stepping out of my comfort zone. Even though the morning I made this dish I caught myself brainstorming even more Mexican meals. Oops. Guess it’s just my thing! 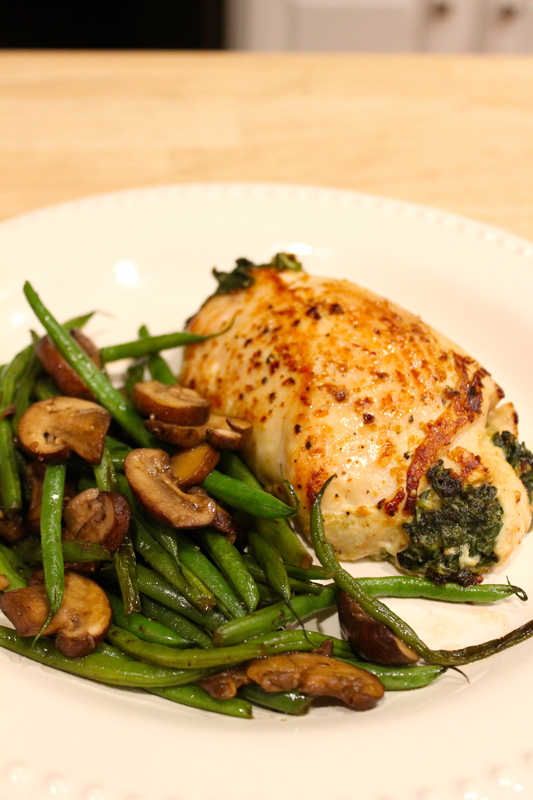 This chicken dish is easier than it sounds, but it’s also perfect for a night that you want to have a “fancy” dinner. Maybe if family is visiting or you want to impress your significant other?! You could easily prep it ahead of time. The spinach and goat cheese mixture can be made ahead – probably even the day before – and kept in the refrigerator. The chicken could be pounded out ahead of time as well. 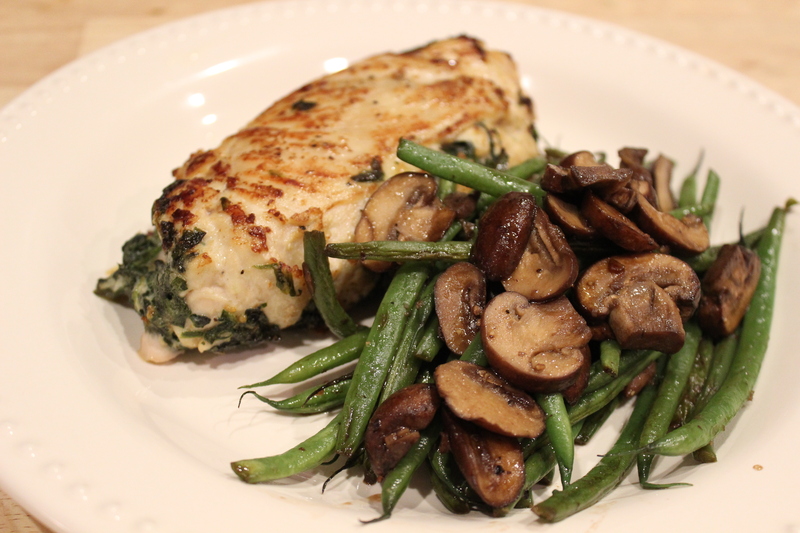 I will post the green beans and mushroom recipe in a separate post. Also, this is gluten free! Pound the chicken, season both sides with the everyday seasoning, and set aside on a large cutting board or work surface. Place the goat cheese in a medium size bowl. Saute the garlic in the teaspoon of olive oil. Add the spinach and cook just until it is starting to wilt. Once it’s wilting, try and tilt the pan to squeeze some of the water from the spinach. I used a rubber spatula. Add the spinach to the bowl with the goat cheese. Season with a pinch of salt and pepper and stir together. 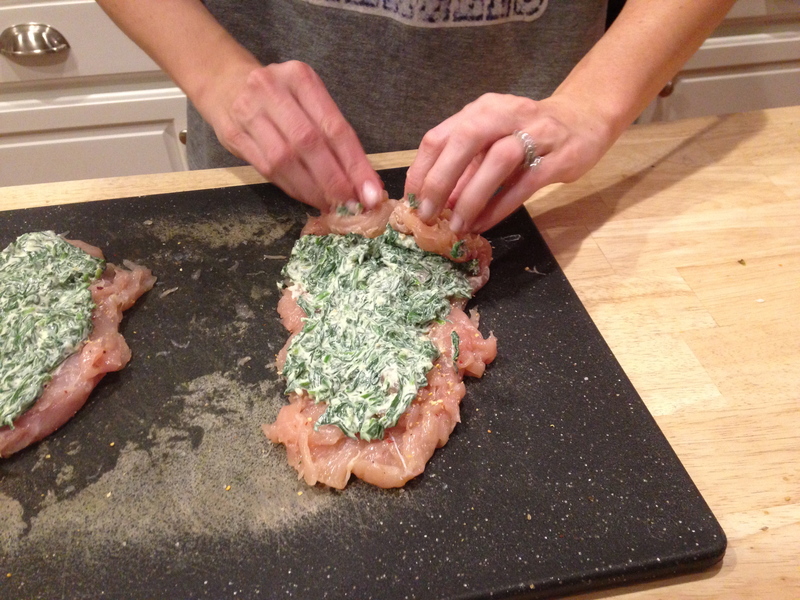 Using the spatula, spread half of the spinach mixture on each chicken breast. (You could probably stretch this amount of spinach to work for 1 or 2 additional chicken breasts). 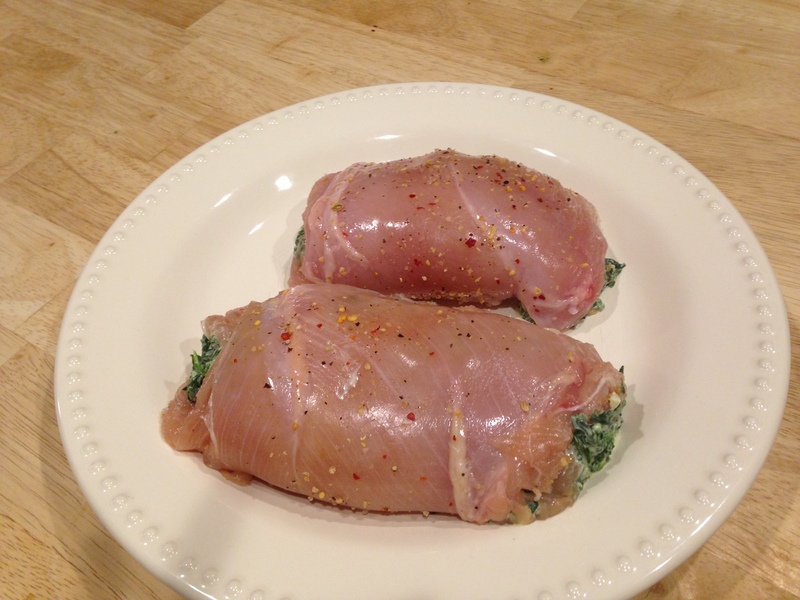 Gently roll up the chicken and place on a plate. Refrigerate for 30 minutes. This keeps the spinach mixture from oozing out too quickly when cooking. Preheat the oven to 350. Heat a nonstick sauté pan at medium to medium high heat. ** Add 1 Tbsp olive oil, and 1 Tbsp unsalted butter. Remove the chicken breasts from the refrigerator and add to the hot pan. Place the side down that has the least exposed spinach mixture. Saute until lightly browned, and continue the process until all sides are browned. Do this gently so that the spinach doesn’t melt out too much! Once browned, add to a greased or parchment-covered baking pan and cook for 12-15 minutes, or until cooked through. 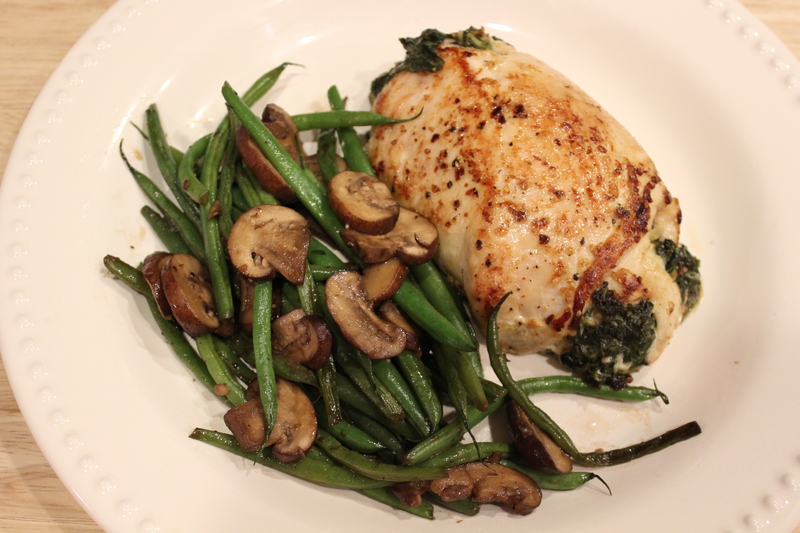 A thermometer should read at least 165 degrees when placed in the middle of the chicken breast. Remove from the oven and let rest for 5 minutes before serving. **This depends on your stove. To brown chicken, I turn mine just above medium. Enjoy! Thank you for reading! I’m trying to quickly write this post while also chasing my toddler around the house, so I’m going to dive right into my 5. :) Happy weekend, ladies! And thanks as always to April, Darci, Christina, and Natasha for hosting! ONE: WE WON!!!! GOOOOO HEELS!!! I’m always proud to be a Tar Heel, but ESPECIALLY proud when we beat Duke. Todd and I are Carolina alumni, and so are my parents. I was raised to love UNC and hate Duke and I love it. TWO: Our delayed Valentine’s date is tonight! My brother offered to babysit, so Todd and I are going out for a nice dinner. Can’t wait! He brought home flowers for me last night, too. I got a good one! And, I love this e-card. Funny and so true. THREE: Anyone tried these? 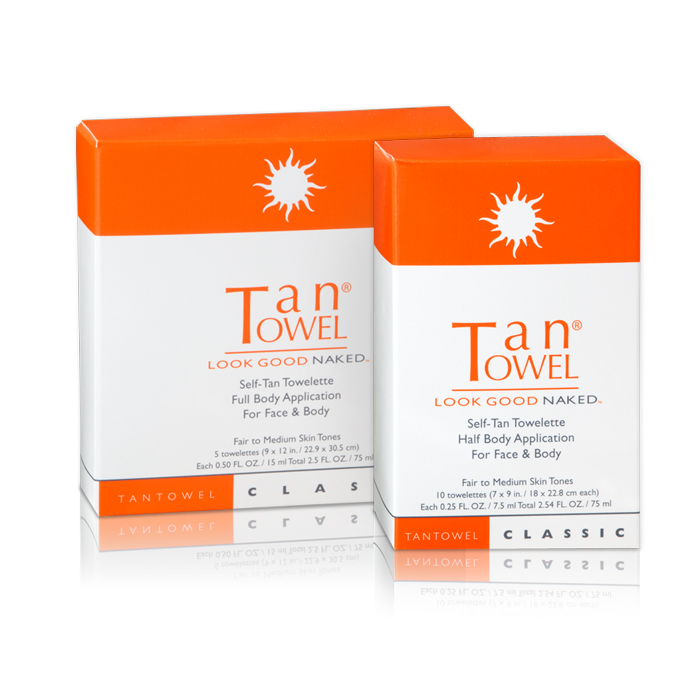 I read a post about these tan towels on Cupcakes and Cashmere from last year and I’m intrigued. I’m very tempted to buy some and try them out. FOUR: How pretty is this bikini from Anthropologie? I’ve been very tempted to buy a nice bikini as motivation to work out more. Gotta get ready for summer! 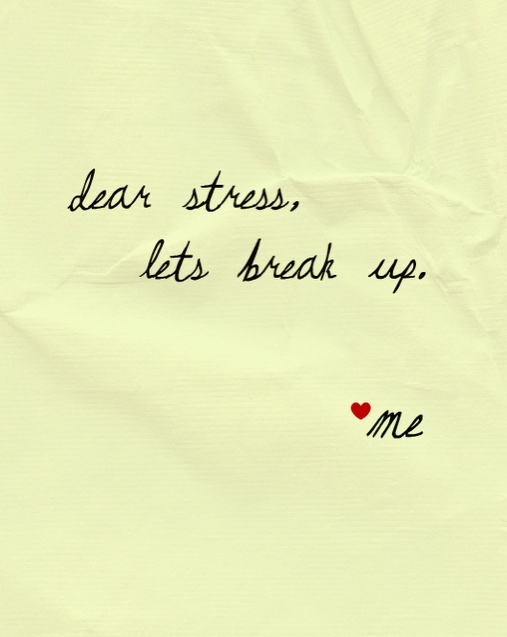 FIVE: Don’t we all wish we could break up with stress for good? I’m going to try, at least for the weekend! Cheers, girls! Have a wonderful weekend and thank you for reading. Dressing the Bump with Pink Blush + A Giveaway!